The climate change agenda that they are endorsing is basically the same one that is in Pope Francis’ encyclical Laudato Si as well as the same one adopted by the United Nations several weeks ago called the New Universal Agenda, also called (by me) the New Catholic Agenda (as catholic means universal). The Vatican’s Pope Francis was the keynote speaker at the UN the day that the New Universal Agenda was adopted. 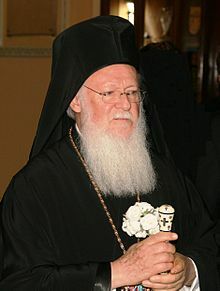 The Ecumenical Patriarch and Archbishop of Canterbury, as spiritual leader of the 80-million strong Anglican Communion made a joint statement between Anglican and Orthodox Churches on the theology of the human person. The above shows that the Eastern Orthodox and the Church of England have been working together for some time to see how they could find areas of agreement to promote. The ecumenical and inter-faith movements are moving ahead, yet they WILL NOT RESULT IN A CLEAN CLIMATE AND REAL AND LASTING PEACE. Many Protestants are falling for it (see Beware: Protestants Going Towards Ecumenical Destruction! and Pope Francis speaks of ecumenism to 52,000 Pentecostals and others). The Bible does not teach that Christians are to ignore biblical reality and pray that they are to be moved into the type of unity that Pope Francis, Patriarch Bartholomew, and apparently Archbishop Welby want. The Bible tells that the ecumenical/inter-faith movement will also end in destruction (Revelation 18 & 19). This is not something that Catholics or the Eastern Orthodox or the Protestants should want (see also Why Should American Catholics Fear Unity with the Orthodox? and Beware: Protestants Going Towards Ecumenical Destruction!). Notice that Jesus will have to destroy a world of armies unified against Him. Then He and the saints will reign. That is when there will be proper unity of the faith. Even the NJB, a Roman Catholic translation of the Bible, concurs. The nations will united AGAINST Jesus. Catholics, Orthodox, Protestants, and others need to be concerned about the type of unity that is actually being promoted. This entry was posted on Friday, November 6th, 2015 at 8:00 am	and is filed under Religious News.